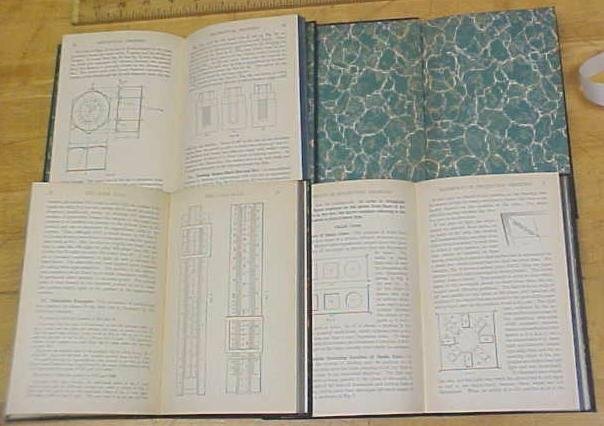 Offering this very nice set of 4 different volumes on similar subject matter including mechanical and geometrical drawing, chemistry, and slide rule trigonometry. All are in very good used condition, all have dark blue semi-hard covers with gold lettering on the spine, and raise lettering on the front cover, inside a fancy designed logo. All are published by International Textbook Company Scranton PA. U.S.A., and all are the same size and design 5" x 7.6". 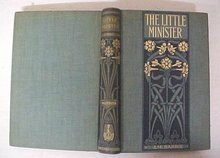 Copyright dates range from 1935 to 1939 on these 4 volumes, edition printing dates in this same year range. All have marbles inside cover pages, all have a red white and blue sticker on the inside blank page, small sticker with no writing on them. Here is a list of titles: 145B TRIGONOMETRY-SLIDE RULE-MECHANICS, 163C GEOMETRICAL DRAWING, 211 CHEMISTRY, AND MATERIALS OF CONSTRUCTION, 212 MECHANICAL DRAWING. These numbers are volume numbers of a very large library of textbooks offered by this same company. The 4 numbered volumes listed are the select volumes offered in this sale, the same as in the picture. These are very well illustrated books, some have fold-out type diagrams, all designed for instruction on specifics about the title subject. Text is easy to understand. All these books have very clean pages, we couldn't find any with any damage to pages, or bindings, very clean overall. A few have very slight rubs on the spine or covers, but still rate in very good condition overall. A very nicely printed set of instruction books! 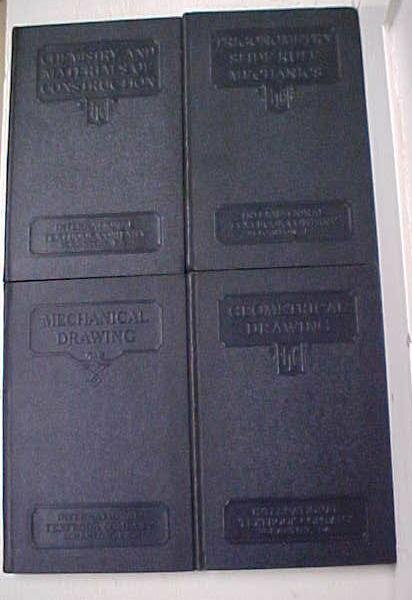 Items Similar To "Machanical Drawing Book Set International Textbook 1939"